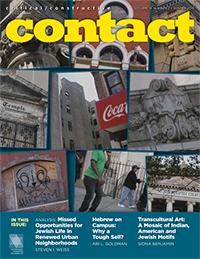 The Spring issue of CONTACT explores the past, present, and potential future tapestries of Jewish life in communities spanning the globe. 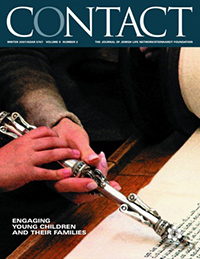 The Autumn issue of CONTACT visits people across the world preserving memory, reinvigorating tradition, and opening doors to more vibrant connections to Jewish life. 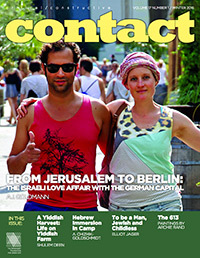 The Summer issue of CONTACT features fascinating forays into the languages and landscapes that have deepened contemporary Jewish experience. 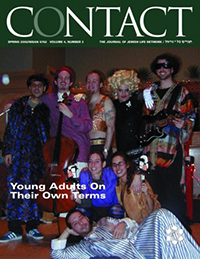 This issue of CONTACT explores diverse facets of an American Jewish community experiencing both transition and strength. 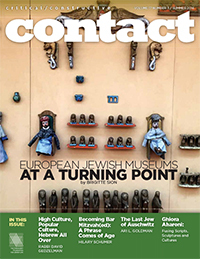 The Summer issue of CONTACT features a diverse array of personalities and perspectives exploring history, memory and cultural meaning in Jewish communities throughout the world. 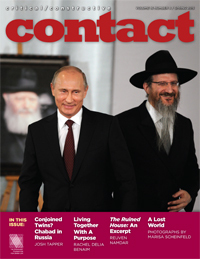 The Spring issue of Contact explores Jewish community, diversity and expression in worlds ranging from a Russian Jewish festival in New York to an artistic interpretation of the Talmud in London. 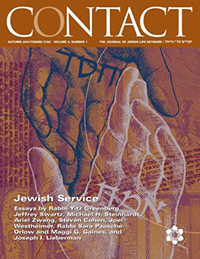 This issue of CONTACT explores landscapes and languages that together weave a fascinatingly diverse fabric of contemporary Jewish experience. 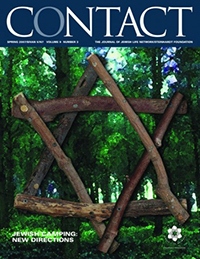 The Spring issue of CONTACT focuses on the Jewish experience in lands as disparate as Moscow and the Catskills, and in contexts as diverse as communal living in New Orleans and New York narratives woven together in the Hebrew language. 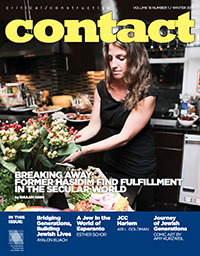 Welcome to the relaunch of CONTACT, the magazine of The Steinhardt Foundation for Jewish Life that provides critical and constructive commentary on the Jewish community. The rumblings could be heard far and wide. Ominous chatter, faint at first, then building in frequency until it became an overwhelming and all-consuming cacophony. There was no longer any hope of denying it: We were being treated to another Study. 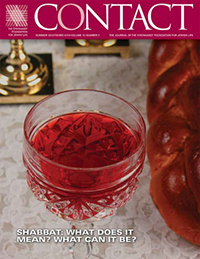 Of all the Jewish holidays, Shabbat is arguably the most well-known — but it is also widely ignored. Lurking at the end of each week, Shabbat is prone to be taken for granted or to be seen as workaday — an odd paradox for a day meant to signify a cessation of work. 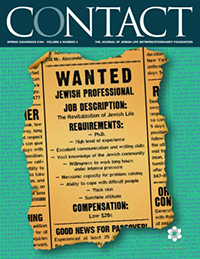 In the Jewish world, the college years are sometimes viewed as a potential engagement vacuum. 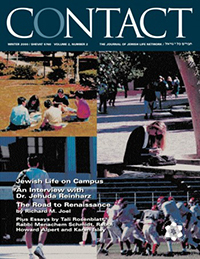 Freed from educational outlets such as day schools or after-school programs and too young to fall in the crosshairs of young adult programming, college students are sometimes considered to be in a potential cul-de-sac on their Jewish journeys. The concept of Jewish identity in Israel would seem to be as self-evident as European identity in Belgium. 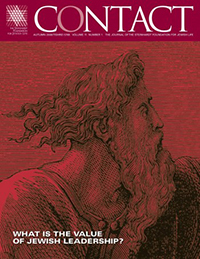 Modern Israel was conceived as a beacon for the world’s Jews, inspired by Jewish philosophy and informed by a desire to chart the next stage in Jewish consciousness. One would expect Jewishness to be its lifeblood. What is identity? “Identity” is a nebulous term, almost as difficult to pin down as terms like “consciousness’ or “faith.” Informed by history and culture, seeded by global currents as well as personal experience, it is both vast and fluid in its multiplicities. 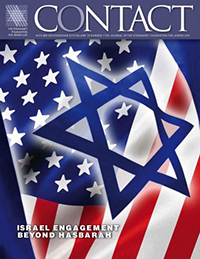 For decades, Israel engagement in North America hewed to a narrow narrative line. If not overtly political, the methods of engagement frequently had politics just beneath the surface. Engagement meant understanding Israel’s importance to the world Jewish community as well as its right to exist — both in a general sense and in relation to the events of the day. This often turned engagement into a reactive enterprise — how the community could shore up support for this policy or for that war, and how Israel’s actions could best be presented and explained. On its surface, Hebrew might seem to be irrelevant to the American experience. Despite America’s status as a beacon to immigrants from all parts of the world, the nation was born and persists in the English language. Even recent efforts towards bilingualism focus naturally on Spanish, the language of the country’s largest contemporary immigrant population. Hebrew would seem to be peripheral to the idea of America. 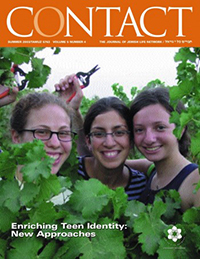 In recent years, the American Jewish community has focused much of its engagement efforts on capturing under-engaged young people. Self-perceptions of decline coupled with diagnoses of disinterest have led to fears that the “next generation”— and with it, the Jewish future itself — was in jeopardy. 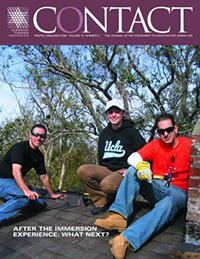 The result has been a major investment in outreach and identity-building endeavors aimed at youth. 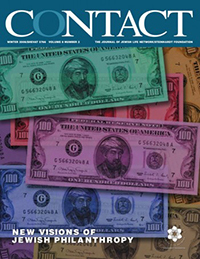 As the global economy lurches fitfully back from the precipice of disaster, many in the Jewish philanthropic community might expect a slow but unwavering return to normalcy: a steady influx of resources, renewed funder commitment, and reliability of near-term as well as long-term giving. Although it is not uncommon to perceive age-old Jewish rituals as rooted in stone or in Sinai, all ritual was at one point new. 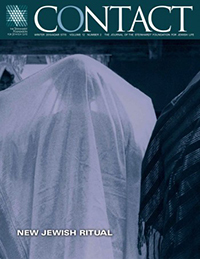 Whether inspired by historical events, communal circumstance or spiritual osmosis from surrounding cultures, Jewish rituals have emerged and evolved as a means to connect with history, with community or with notions of the Divine. 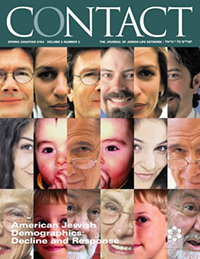 The current chapter of the American Jewish story is unique: Never before in Jewish history has a society been so receptive to Jewish culture, ideas and people. Here Jews experience not only tolerance, but celebration. 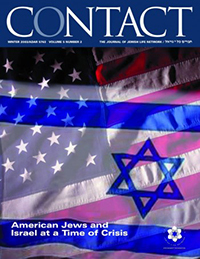 This has engendered a central paradox of the Jewish engagement industry: the effort to entrance American Jews about Jewish experiences might seem superfluous in an era in which America itself affirms Jewish culture and values. 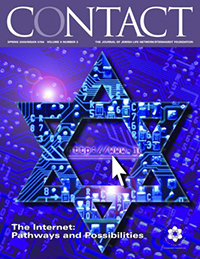 The Jewish communal world often operates in a vacuum. 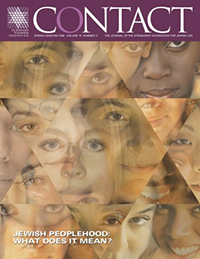 By its very nature, the enterprise of nurturing and sustaining a particular identity in the multicultural quilt of American society necessitates a seemingly introverted focus. Thus it is that much of the innovation in the Jewish world percolates in its own universe, separate from the outside world. In the Jewish community, the concept of leadership often conjures thoughts of professional development, management training, or the relationship between lay leaders and professionals. What is often lost is the larger question of what constitutes genuine leadership, and what attributes the Jewish community needs in its leaders. As the most recent buzzword occupying the minds of Jewish professionals — replacing “continuity,” “renaissance” and “Matisyahu” — the term “Peoplehood” has been given much attention lately as the newfound rhetorical panacea in Jewish life. 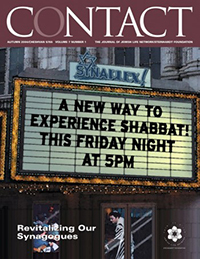 In recent years, the Jewish community’s widely successful forays into total-immersion experiences have received much attention and praise. From long-standing institutions like summer camps to more recent innovations like Birthright Israel, immersion experiences offer unparalleled opportunities for intensive Jewish encounters shorn of the distractions of everyday life. 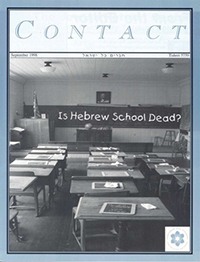 There is arguably no venue of Jewish education that has received greater condemnation and scorn than afternoon schools. 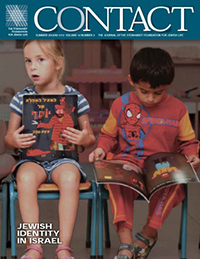 To hear many community leaders tell it, Hebrew schools are both cause and symptom of seemingly ubiquitous declines in levels of Jewish affiliation. As Jewish camping has achieved almost universal recognition as a top-notch arena of informal education, the camping movement is increasingly focusing on ways it can maximize camping’s potential and broaden its appeal. 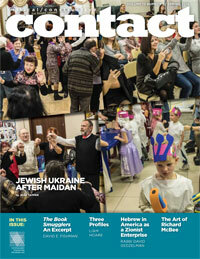 Recent decades have witnessed a proliferation of programs designed to intensify Diaspora Jewish life. Although each has met with varying degrees of success, it has become clear that one of the most significant determinants of a program’s effectiveness is the retreat component. 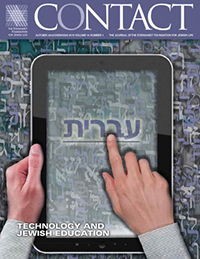 In recent years, the Jewish world has come to appreciate the crucial importance of research and evaluation. It is now accepted that without formative analysis at all stages of an initiative’s creation and implementation, programs aimed at the revitalization of Jewish life will have a haphazard chance of success. The most revolutionary innovation of the Internet is arguably its democratization of information and of communities. Not since the advent of the Gutenberg press have the barriers between people and data been so widely traversed. As China’s recent dealings with Google and Yahoo reveal, it is this open access to information that terrifies repressive regimes. From Abraham onward, generosity has played a crucial role in the inception and evolution of Jewish values. Even today, in an age of interdenominational quarreling and competing definitions of Jewish authenticity, most Jews can agree on the primacy of tzedakkah. But there are varying interpretations of what tzedakkah entails. Inherent in the relationship between any community and the arts is a tension over representation. Creative artists seek to express things anew, whereas community leaders often have a vested interest in visions and celebrations of the status quo. In such an atmosphere, conflict is inevitable. Pharisee, Sadducee, Essene; Karaite, Rabbinite; Kabbalist, Philosopher; Hasid, Mitnaged; Zionist, Bundist. Throughout history, the Jewish people has been demarcated by precise, mutually exclusive categories. 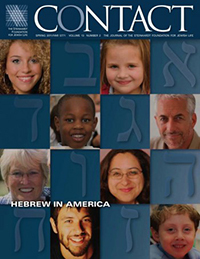 With the advent of denominations in the nineteenth and twentieth centuries, Jewish identification stratified still further. “Just Jewish” was never enough. There was always an adjective waiting in the wings. To many people, the phrase “traditional Jewish family” calls to mind a husband and wife and at least three children, possibly seven. It might summon inherited memories of the shtetl, or images of a father and mother surrounded by their parents and children at the Seder table — three generations, reproducing mightily and wrapped in a web of mutual support. For those seeking to engage the next generation of Jews, the college years present both opportunities and risks. 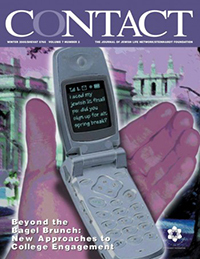 In recent years, the community has turned its attention to the former. 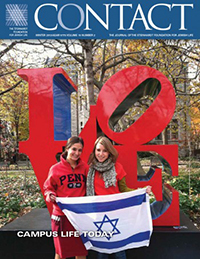 Multi-culturalism and self-discovery — two qualities of campus life that sometimes frighten the insular — have the potential to galvanize students towards a rediscovery of Jewish culture. For nearly 2000 years, the synagogue has been one of the most emblematic and recognizable institutions in Jewish life. 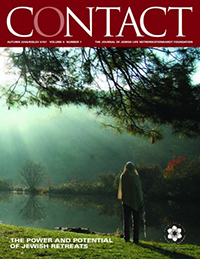 At various times, it has served not only as a sanctuary of prayer, but as a focus of community administration and social life. But in the past two centuries, the synagogue has lost much of its resonance for non-observant Jews, particularly among young people. 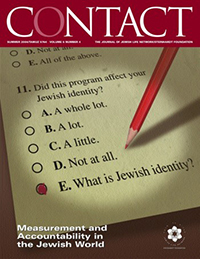 Creating and implementing Jewish identity programs can sometimes seem like shooting darts in the dark. Isolated in our Jewish non-profit cocoons, surrounded by others in the same profession, it can be difficult to know whether our ideas are profoundly visionary or foolishly misguided. At a recent dinner attended by young people working in the Jewish community, talk turned, as it often does, to the topic of Jewish professional life. 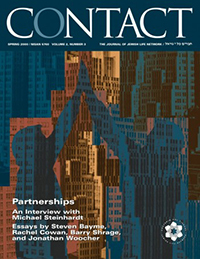 Conversation focused on a lay leader active in both Jewish and general nonprofit organizations. 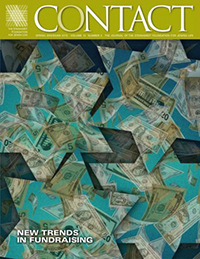 On the boards of the general nonprofits, the philanthropist had developed a reputation as a kind-hearted, patient and humane leader. 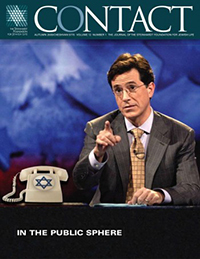 For the past dozen years, many American Jewish institutions have tailored programming towards that elusive yet abundant breed: the unaffiliated Jew. Millions have been spent on new programs that promise to reach Jews who lie outside the community’s orbit. Since the beginning of our history, Jewish destiny has often been shaped not by individuals acting in isolation, but by movements of dreamers, seekers and activists inspired by a cohesive ideology. 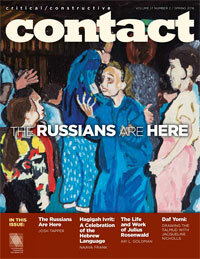 Sometimes these movements last a couple of decades; other times, they become permanent fixtures of Jewish experience. 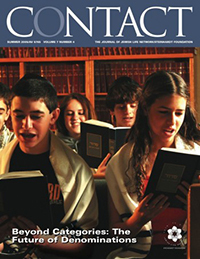 For vast segments of the American Jewish community, the Bar/Bat Mitzvah celebration is not an entrance exam into Jewish adulthood, but the final exam of one’s Jewish affiliation. For all the effort that precedes the event — the immersion in Hebrew school, the preparation to be called to the Torah, the study of adult responsibilities — B’nai Mitzvah observances are more often than not followed by an immediate drop-off in Jewish affiliation. Many experts have argued recently that Jewish population statistics reveal a community in the midst of stagnation or decline. 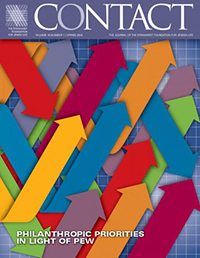 Although studies vary depending on methodology and definitions of Jewishness, the soon-to-be released National Jewish Population Survey lends support to the view that our population has been shrinking since 1990. The concept of clal yisrael teaches that the Jewish people are bound together in mutual experience, responsibility and destiny. In the United States and Israel, the countries in which the vast majority of the world’s Jewish population dwells, it has not always been easy to apprehend our shared experience. 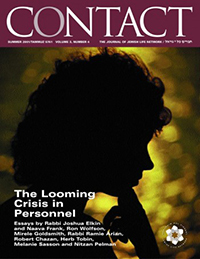 As this issue of Contact was being readied for publication, the staff of Jewish Life Network/Steinhardt Foundation received the tragic news that its beloved Executive Director, JJ Greenberg, had been fatally injured by an automobile while riding his bicycle in Israel. 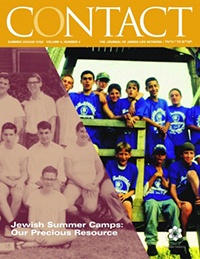 Jewish summer camp is a uniquely American phenomenon. 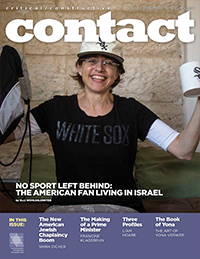 Although today we often associate camp with leisure activities — softball, Israeli dance, lines at the canteen — camps have always served an indispensable purpose in the community. Originally, Jewish camps were created to ameliorate the grim conditions of city life. 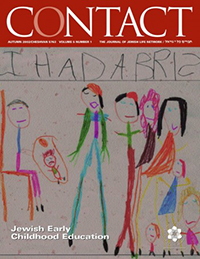 Years ago, Jewish day schools were generally associated with the most rigorously observant segments of the Jewish community. But things have begun to change. 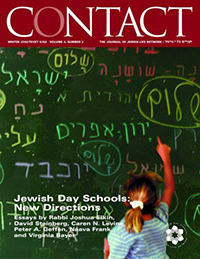 According to a 1999 Avi Chai census of American Jewish day schools, day school enrollment saw a dramatic increase in the 1990s. 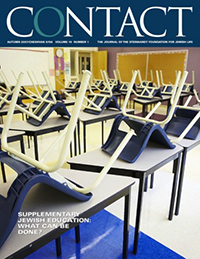 Among community and non-Orthodox day schools, enrollment rose by nearly 25 percent. 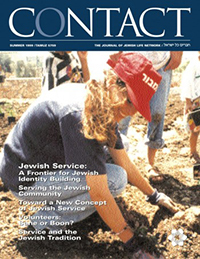 Jewish life once revolved around service. A hierarchy was established in which the greatest esteem was attached to good deeds that could not be repaid. 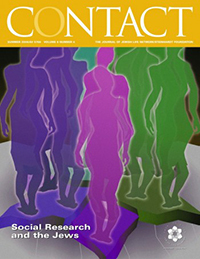 Since caring for the dead was an example of absolute altruism, membership in burial societies became the highest honor. 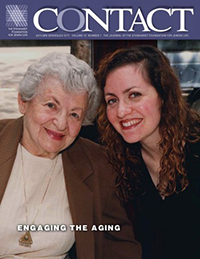 In recent months, headlines in Jewish newspapers have highlighted a disturbing trend in American Jewish life. On the one hand, some of the community’s most prominent educational leaders announced plans to step down. Although their reasons were diverse, the announcements were taken as evidence of a looming “leadership vacuum” in American Jewish life. 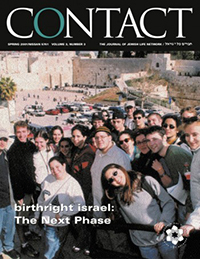 Birthright israel began as a dream. 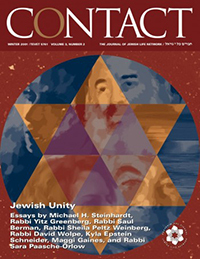 In its earliest form, the program envisioned a radical change in the Jewish world, one that would plant within even the most assimilated young Jews the seeds of their heritage. 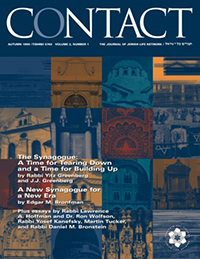 Its scope was grand and quixotic: the creation of a new Jewish life cycle event, the cementing of the relationship between the Diaspora and Israel, and the reinforcement of the selfless communal bonds of the Jewish people. If it is true that all systems tend inexorably toward disharmony, then the Jewish people might be the perfect model of disorder. 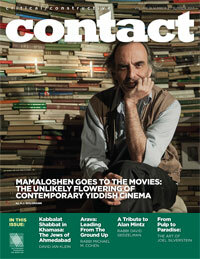 The theme of disunity, of a people warring against itself, bobs through the major waves of Jewish history. The Bible itself chronicles enough sibling squabbling to fuel several lifetimes of lawsuits. Since the Second World War, the State of Israel and the Holocaust have served as touchstones of Jewish identity in America. 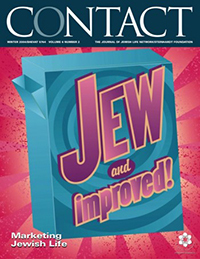 More recently, catchphrases such as “continuity” and “spirituality” have begun to play more prominent roles in the national Jewish lexicon. 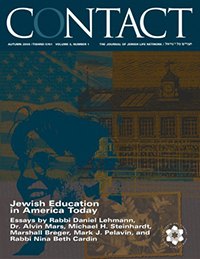 Today, more and more of our leaders and organizations are talking about the critical importance of Jewish education to both identity formation and the revitalization of Jewish life in the United States. 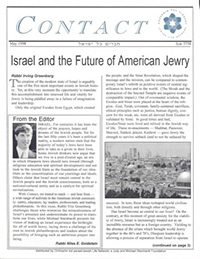 Forming Partnerships in a Time of Division It’s no great secret that we live in a period of discord and division in the American Jewish community. There is so much infighting among competing organizations (e.g. Anti-Defamation League vs. American Jewish Committee), different movements (e.g. 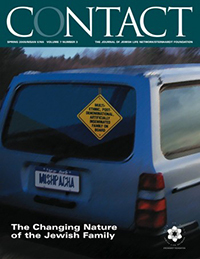 Orthodox vs. Reform), and disparate communities (e.g. Diaspora vs. Israel) that it can sometimes seem as if American Jews are more interested in guarding their turf or in conserving their ideological purity than in energizing and sustaining an ancient people and a rich religious tradition. The University and the Jews: An Era of Renaissance or an Age of Darkness? There is a great debate taking place within the American Jewish community as to whether we live in a period of decline or of opportunity in terms of Jewish life and identity. 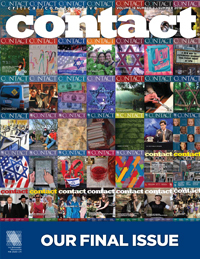 Needless to say, and perhaps in sharper and more intensified ways, the same socio-religious dilemmas and struggles at the heart of this internal debate affect the lives of the large number of young Jews on college campuses. 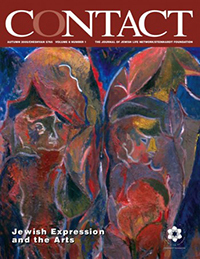 This issue of Contact is devoted to exploring the topic. According to many Jewish thinkers and leaders today, the synagogue is in a state of profound crisis. 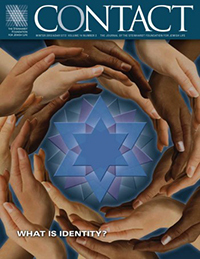 Since the synagogue is one of the most ancient, visible and important institutions in Jewish communal life, this could have dire consequences for American Jewry: the vitality of the synagogue has often been used as a barometer of the health of the Jewish community as a whole. The Torah is very clear: it is a Jewish mandate to “serve” (la’avod) God. But what exactly does “service” mean? Throughout the centuries, it has meant a wide variety of things, from offering pigeons and goats for sacrifice, to praying alone or with others in community, to building up the land of Israel. 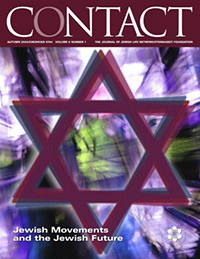 With no firm historical consensus as to what the concept of Jewish service actually means, its implementation and practice have changed and evolved with the Jewish people over time. 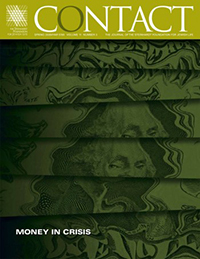 In the sixties, the popular mantra among American youth was “Don’t trust anyone over thirty!” Those who were older and in positions of authority and leadership were viewed—at best— with suspicion and treated—at worst—as spiritually bankrupt, having sold out their ideals for the sake of acquiring fancier cars and bigger homes.